Naturopathy is based on the philosophy first used in the Hippocratic School of Medicine from around 400 B.C. as healing all with the healing power of nature noting the body's ability to create, sustain and restore health. The Naturopath in London identifies and removes obstacles to health and helps the patient build the right environment to support good health. The naturopathic doctor goes to school primarily to become a mainstream physician. The true Naturopath only wants the best for the person the best food, the best water, the best natural remedies, and the best lifestyle. A true Naturopath follows their own philosophy that encompasses a holistic approach to medical care, care that focuses on cleansing and strengthening the body so it can heal itself. 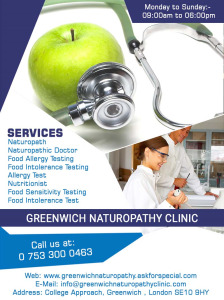 Greenwich Naturopathy Clinic is the leading clinic providing quality food intolerance testing in London to measure the real obstacle of your course to good health.